We are continuing our ascent in Trinity season, Sunday by Sunday, in gentle steps leading us into the heights of heaven. This mornings readings are put before us to remove from us a certain barrier that may be keeping us from ascending further up the stairway. We know that we have, by grace been ordering our lives outwardly to conform more and more with the commandments that Jesus sets before us, that we might walk in the ways of love. And in the last couple of Sundays we have turned our attention towards the inner life of the soul. Jesus comes to us inwardly and helps drive out all the discordant noise within so that we can hear him teaching us daily in our souls, in the Temple that is our body. And last week we were reminded that we will continue to grow and mature as Christians if instead of looking at others and comparing ourselves with them, we continue to look within ourselves and see that we too must always rely on the mercy of God. This morning we have a similar message to last week – it is still about needing to trust in the mercy of God – but it reveals itself in a different way. Supposing we do look within and are listening for a word from God inwardly, and the word we hear is one of judgement and condemnation of our outward actions, or of our inner motivations. We might find this to be discouraging and we might find ourselves feeling dejected, sad. And in response to this, we have a few options. 1. We might choose to stop looking inwardly, afraid of what we see. So instead we return from that inward gaze and to attending only to outward things, distracting ourselves from what we heard, busying ourselves outwardly. But we still hold this unresolved illness, and we become discouraged. And perhaps we find ourselves withdrawing somewhat from our spirited engagement in the world around us. We heard the voice inwardly, and we didn’t like what we heard, so we stopped listening, we became deaf to that inner voice, the voice of the Spirit, to the voice of God that was arising within us. 2. We could create another voice asserting that we are not sinners really, in fact we should think more positively about ourselves. The problem with that is that we have not really dealt with the reality that we do mess up outwardly and inwardly all the time and so however much we want to assert that we are OK, that we are good, that all is well, it is not being honest. It is a kind of whitewash and we will live only partly in the truth and so will not really be as free as we could be. [If we say that we have no sin we deceive ourselves and the truth is not in us.] We will not grow in Christ, our ascent up the stairs to heaven is halted, it is as if we have sat down on the step. But you might say, how do we know that inner voice of judgement is not simply a voice from the past of an over demanding parent or some overbearing teacher that brought us down? Maybe that is part of the burden you bear. If this is the case, you need to take time to reflect on the voice to see if it is simply a voice of discouragement from the devil or how much of that voice may be of God. An inner voice that continually recalls a sin that we have confessed and received forgiveness is not the voice of the Holy Spirit speaking inwardly. But if we are shown some new insight about our actions or thoughts or motivations that reveals something contrary to love, then we should admit it freely and trust in the mercy of Christ. We should not avoid all voices of judgement inwardly. Our readings this morning show us a way of hope and of great encouragement. In the Epistle, St. Paul compares the two covenants – the Covenant in the Old Testament, where Moses received the Ten Commandments, they were written on stone and people were called to follow them. They were taught that when the commandments were broken, restoration came through the offering of various sacrifices. The people learned that they could not rely on themselves but must trust in the mercy of God. But knowing the right way, was not enough, they began to look for a Messiah, a Saviour, One who could change their hearts – because the Law by itself cannot do that. St. Paul describes the Law as a covenant of condemnation. 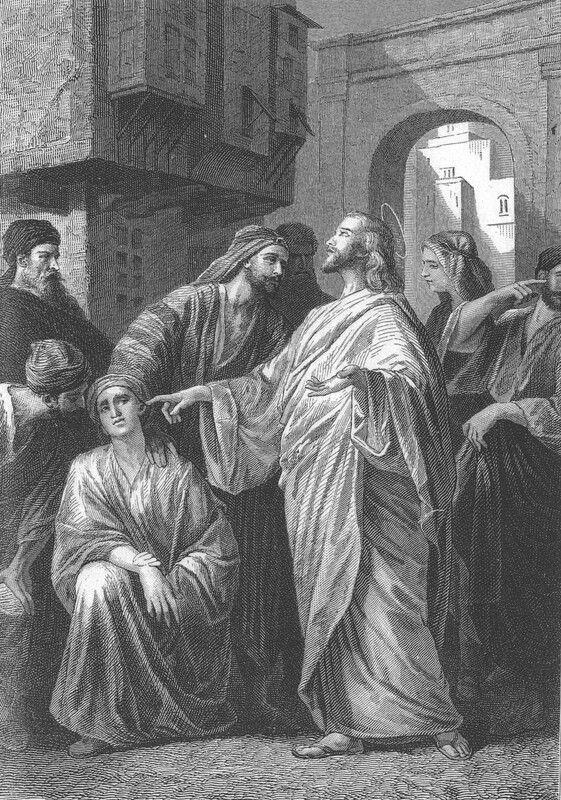 The New Covenant in Christ still involves a certain judgement of our actions inwardly – the Spirit of Christ reveals in our hearts when we stray, but we are no longer afraid of such judgements inwardly – Jesus assures us that such judgement is for the purposes of our amendment of life, that we might know and walk in the way of love. He assures us because he gives up His life for us on the Cross and pours out his pure and sinless blood to wash us and restore us perfectly. In this New Covenant the Spirit of Christ is not just revealing our errors (as the Law did), but in this more glorious covenant, our hearts are being reformed inwardly so that our desire can be released to its true ends, the love of God and our neighbour. In the Old Covenant, which was glorious, the children of Israel could not stedfastly behold the face of Moses for the glory of his countenance, which glory was to be done away; how shall not the ministration of the Spirit be even more glorious? asks St. Paul. You remember the story of Moses, how he went into the Tabernacle alone to speak face to face with God, and when he returned to the people his face shone, and they were afraid, so he veiled his face. But the face that we are being made ready to behold is that of Christ – now we see through a glass darkly, but then face to face. The Spirit is given not just to reveal our sins, but to reveal them so we can get past them and be led more deeply to look steadfastly upon the face of God! Such trust [such confidence] have we through Christ to God-ward ­ that we are not discouraged by these revelations of waywardness but are encouraged by them all the more to seek out the perfection of Christ. We are being introduced ever so gradually in this Trinity season, in these gentle steps upward, to the life of contemplation, to the life of a loving beholding of God and of a resting in that seeing. And something happens to us, as our inner vision, that inner mirror that is our soul, is perfected by the blood of Christ. As our soul is perfected, we come to see ever more clearly, the face of Christ inwardly. And as that happens, our mouths are opened more and more in prayer and in praise. Our Gospel this morning illustrates simply and clearly that Jesus has this power. And they bring unto him one that was deaf, and had an impediment in his speech: and they beseech him to put his hand upon him. Surely this is the situation of each of us if on our journey we choose to no longer listen to the voice of the Spirit inwardly revealing where we have strayed, or are afraid because we hear the voice of condemnation but do not trust that it is a voice full of mercy. And if we refuse to hear this voice, and remain in our sins, the spiritual reality is that we find we have little desire to pray to God or to praise God for his goodness - we don't know it. And [Jesus] took him aside from the multitude, and put his fingers into his ears, and he spat, and touched his tongue; and looking up to heaven, he sighed, and saith unto him, Ephphatha, that is, Be opened. And straightway his ears were opened, and the string of his tongue was loosed, and he spake plain. And he charged them that they should tell no man: but the more he charged them, so much the more a great deal they published it; and were beyond measure astonished. Surely this is what happens to us as we come apart from the multitudes to worship God on Sunday, as we freely confess our sins and trust in the mercy shown us and then eat the Bread of Heaven and drink from the Cup of Salvation. Surely this is what happens when we go apart from the multitudes into a room by ourselves to shut the door and contemplate the mystery of God and discover the Truth revealed to us. Is it not the case that if our Lord should insist that we remain quiet after Holy Communion or contemplation leading to the Truth that we could not but open our mouths in prayer and praise? Is it not the case that we would find ourselves wrapped up all the more in this divine comedy, unable but to sing out the Gloria with zeal and the joyful laughter of angels?Surely He hath done all things well; he maketh both the deaf to hear, and the dumb to speak. And we agree when we cry out gladly…Glory be to God on high, and in earth peace good will towards men. We praise thee, we bless thee, we worship thee, we glorify thee, we give thanks to thee for thy great glory!